The second release this year from this talented band means I can borrow from my review of the first one, Running Out Of Time, to introduce them. 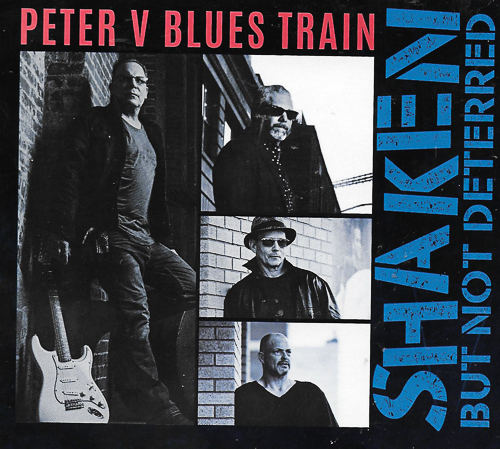 Peter V Blues Train is a band that has been building quite a following over the pond and could well make a splash over here. Now in his early 50s, Peter Veteska (hence Peter V) was born in Manhattan. A self-taught musician influenced by Derek And The Dominos, Alvin Lee and The Allman Brothers, he began playing professionally at age 15 but became disillusioned by the music business at 21. After being a builder, he didn’t pick his guitar up again until nine years ago when, I guess, he felt that things just might be different. I summarised that last album with… ” this is a fairly diverse collection of quality blues, with strong playing from every member of the band. I can imagine that their live shows would be something to see too. Well worth a listen if you like Moore, Marsden and the like”. Coming hot on the heels of that one is the brilliantly titled Shaken But Not Deterred: so let’s see if it lives up to the standard and promise of the last one. The opening track, Don’t Wanna Leave Memphis, starts with a great drum shuffle before the band cut in with a true blues guitar phrasing and backing. Peter name checks some of his heroes of the blues as the whole band lay down a solid shuffle and then a hugely entertaining B3 solo quickly followed by sax. Blue Monday, made famous by Fats Domino, is updated in a clever way with the essence recognisable but the extra blues infusion, via the B3 and guitar solos, make it a delight. By The River is a remix of a 2017 Peter V track. This version keeps the blues below the funk in an ingenious way; the intro pulls you straight in and I can imagine the great Tommy Bolin would play something just like this. For all We Know drops the pace and increases the pathos with a soul-drenched blues. Originally written by Koots (sometimes Coots) and Lewis and probably best known by the Nat King Cole version, it is a little laid back and ‘Coleish’ for my taste, but the instrumentation and vocals are still strong. In Demand returns to funk with a mid-paced treatment and the keys and horns with the guitar come together with some seriously funking! The classic T-Bone Walker penned T-Bone Shuffle remains just that…a shuffle but here the tune is weightier and has great guitar and organ interplay and solos. Alibi is far and away my favourite with the true heavy blues riff and the drums and bass are solid as a solid thing. The vocals, although always quality, fit even better on this kind of modern blues. The B3 adds colour and the guitar oscillates between funk and blues runs in a great way: the solos are outstanding. Don’t Cheat On My Lady steps back into proper rock ‘n’ roll as Peter channels Chuck Berry in a Johnny B Goode style. A piano solo joins in the R’n’R feel before Peter and Chuck meld in a great guitar solo. Rodeo (no BS) is solid Chicago blues with the B3 and guitar in perfect harmony. A sax solo imposes itself before the guitar takes over. Getting Closer Now has a great drum intro before the guitar/B3/harp trio lay down the blues tracking and then Peter shares the verses with the wonderful Vanessa Vause, who brings an added touch of class with her crystal clear vocals. This is a classy and really well thought out piece of soul/blues. Been So Long has that funky guitar backing again but this song is a curious fusion of styles with East and West coast featuring as well as funk-blues. The carefully toned and picked solo is worth the wait. Title track, Shaken But Not Deterred, has a distinct Albert Collins feel in the guitar phrasing but, with the time changes and string attacks it ends up more like Poppa Chubby playing Collins by way of Albert King…and all of that is a good thing. Final track, Worried Life Blues is a great update to the Big Maceo song. (It is billed as a bonus track, whatever that means in this day and age). It is an acoustic reading with guitar and sax paying due tribute to the superb original. An enjoyable foray into the past, although I would have preferred a lot less sax and a helluva lot more guitar. This latest release more than lives up to the previous one and has a similar spread of quality blues with plenty of invention and variation…OK, for me they could have omitted For All We Know, as it just didn’t fit with the rest of the blues of the other tracks…but that’s me, I’m sure many will argue for its inclusion. Regardless, this is still a powerful album of varied blues that will not disappoint. Thank you so much for this thoughtful review.